My Giant winter bike weighed about 25 lbs new, but the suspension fork and a Brooks saddle probably bring it nearer to 28 lbs (I must weigh it). That isn't a fire extinguisher in the bottle cage. 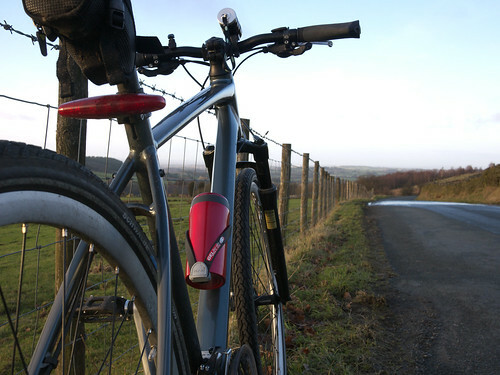 For this afternoon's ride I decided to try the red Lifeventure thermal mug I was given at Christmas, filled with hot tea. It seemed pretty heavy so I weighed it: 1 lb 5 oz full. Out of curiosity, when I got back I weighed everything else on my bike. So the equipment I carried weighs just short of 14 lbs, or about one stone – half the weight of the bike. The bike and the equipment weighs three stone. At eleven stone, I weigh approximately 3.67 times as much as my bike plus all the gear. The tea in my Lifeventure thermal mug was hot when I made it and pleasantly warm when I drank it a couple of hours later. Air temperature about 3°. I finished 11 ounces heavier but my gear was lighter by the same amount. Posted by Patrick on January 9th, 2011. I've never weighed my bike (altho I obsessively weigh my camping gear) but when I add a stove and a water bottle for Sunday club rides it is noticeably heavier when I lift it. As I have a Carradice saddle bag I have a lot of scope for adding heavy stuff 'just in case'. I've been using those thermal mugs for a while (mine's blue of course) and am very impressed. It starts losing heat after 2-3 hours but thats plenty for a ride. I usually fill it with boiling water and carry tea bags and a small bottle of milk seperately. That looks an interesting arrangement to secure it to the bike. I found a neoprene bottle carrier in a charity shop. I cut off the strap and it sits beautifully in my bottle cage with the mug inside. Dennis and I both have one and never travel on trains or ferries without them. How do you manage without mudguards in this weather? I had intended to fit some mudguards but never got round to it. The tyres aren't too bad. A bit of dirt up my back but not enough to bother about. The bike gets a bucket of water over it occasionally. I would never do that to my steel tourer. That is just a bottle cage holding the flask. I don't bother very much about weight either. The flask just seemed really heavy and it resulted in a weighing-fest 😆 . I also noticed the non-mudguards. We use them for touring and commuting, but otherwise I find they are a nuisance. Actually they are a real nuisance when packing a bike in a box. Unlike Garry, I like our bikes to be "packaged". We've tried them in bags, boxes, hard shell cases, and naked – there's no perfect way to do it. Mary weighs every item when we pack for a tour. She gets a big kick out of recording each item on her kitchen scale and writing them all down. Then we pack it all anyway. The roads look good for riding. I'm jealous. Brown Bike currently tips the scales at a humongous 18.5kg (40.7 lbs). That includes massive D-lock, rack, one crutch, mudguards, lights etc. But I've also put on weight. I was officially 67.7 kg yesterday morning, which was 1.7kg more than usual. I daren't weigh myself. I was 12st 8lbs last autumn, but as I've cycled less and eaten more, my waistline has increased. I'd like to bet I'm not the only one! My Mercian weighs 23lbs when stripped down to the bare essentials, but increases somewhat with mudguards, Garmin 705, saddlepack of tools, bottle of water etc. I suppose 26 to 28lbs. Heavy enough, but not as heavy as me! There is a lot spoken about lightness of bikes, and how a fat chap shouldn't have spent very much to get a light bike and how a heavy bike wouldn't be different for him, and how he'd be better on a diet! I'm sure about the sentiment, but not too sure about the logic. Even if the rider is heavy, a lightweight bike can feel better than a heavy bike. A lighter bike is springy and responsive, whereas a heavyweight can feel sluggish and dead. Anyway, that's my opinion. Argue if you wish!